Restology Project_Indoor bioplastic panel design, and fabrication process from Restology on Vimeo. Restology, is a project that seeks to use environmentally-friendly materials to reduce environmental pollution. Restology is a gelatin-based bioplastic with activated charcoal in its ingredients, which has the capability to chemically attract and adsorb airborne pollutants. We tested a large number of formulations in order to find one with just the right physical and chemical properties, which were analyzed through laboratory testing to get the right porosity and a high adsorption rate while remaining completely biodegradable and environmentally-friendly. 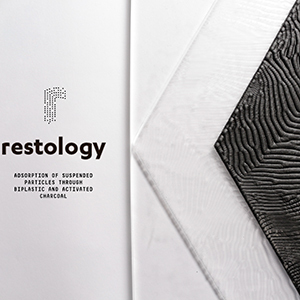 Restology is an easy home-made recipe, prepared with water, vegetable glycerin, pigskin gelatin, and activated charcoal; what makes our solution stand out from the rest is that throughout its development our team remained focused on the fact that, for it to have a net positive impact on the environment, the material could leave no trace of itself after its life cycle is finished. This led us to use organic materials in its creation, which, rather than harm the environment, provides nutrients and substrate for organisms to grow on. These same organisms which help decompose the bioplastic itself turn the pollutants adhered to it into less harmful substances through enzymatic degradation when disposed of in compost. Another key aspect is the ease of replication and the open source nature of the project. This allows us to have a broader reach and gives users on any corner of the planet easy access to solutions which allow them to breathe cleaner air. Indoor: A flexible and modular panel which can be adhered to interior spaces, providing clean air. Outdoor: A structural concrete module designed to concentrate airflow in its interior, which is coated with our material, in order to clean the air passing through said structures. Air is arguably mankind’s most basic need. Since the first industrial revolution, humans have been relentlessly polluting the environment as a consequence of using non-sustainable manufacturing techniques and materials, as well as having consumption habits that are not friendly towards the environment. Every year, the amount of people who die from health issues related to air pollution is rising—therefore, we felt the need to address this issue and develop a solution that will have a real, measurable impact upon the environment. Our project was inspired by the quickly declining air quality in Monterrey Mexico. In the span of 100 years, the city went from a nearly pristine city between the mountains to the most polluted city in Latin America. Industrialization made our city grow and prosper, so we felt the need to address the issues stemming from this and work towards providing easy, accessible solutions for polluted air remediation. Because of this, we were very strict in validating our materials to ensure that they can clean polluted air in a real-world scenario. Our vision for the future is to live in a world where we are more aware of the environment and our impact on it, and projects like ours provide accessible and viable solutions for environmental issues. Based on the research, and the developed material, two applications were proposed for both indoor and outdoor spaces. Indoor: The panels were created digitally in Grasshopper and the mold manufacturing was done in a 12mm thick acrylic plate from two parameters codified in RhinoCam: Horizontal Roughing Software, afterward the parameter Parallel Finishing; which creates the pattern figure and had a 40% definition. The geometries were developed on Alan Turing’s model of reaction-diffusion, which simulates the interaction of two chemical factors that react to each other diffusing in space. With this reference, the geometries created contain texture on the panels that allow it to increase the surface area of each one. The geometry used its base on a hexagon about 20x20cms. As the analysis came through and based on the research, it was decided to create holes inside of the hexagon that would allow the airflow through the geometry and increase the contact area. The internal hexagons are intended to have different lengths; the inner diameter is distinct to the airflow through the middle of the geometry. These small variations can control the conduction and the airflow passing through the geometries. To elaborate the molds is necessary to design and generate first the geometry in 3D to visually interpret the design with its established measures. 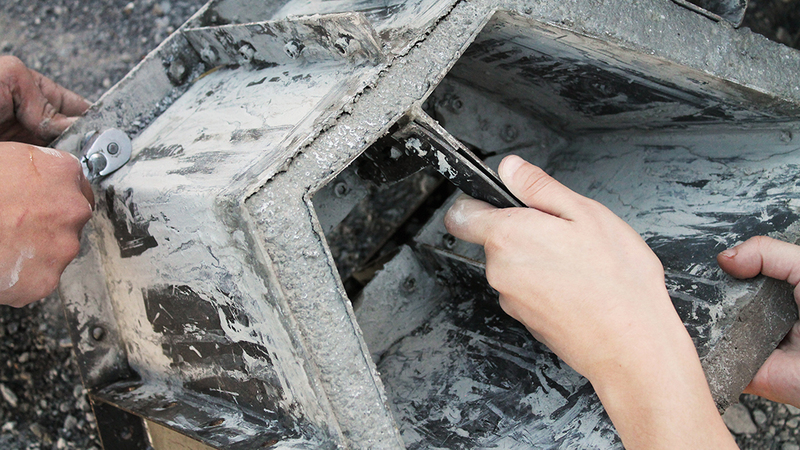 Once the 3D model is ready, an offset of the piece is made to generate the walls of the mold. Then is made an exploded view which consists of placing each face of the piece flat (2D) to cut it with Waterjet in a 2mm flat metal sheet. Then, the lashes bent off and the pieces are assembled with screws, ready to fill it with concrete and then covering the interior with bioplastic as a flexible coating. 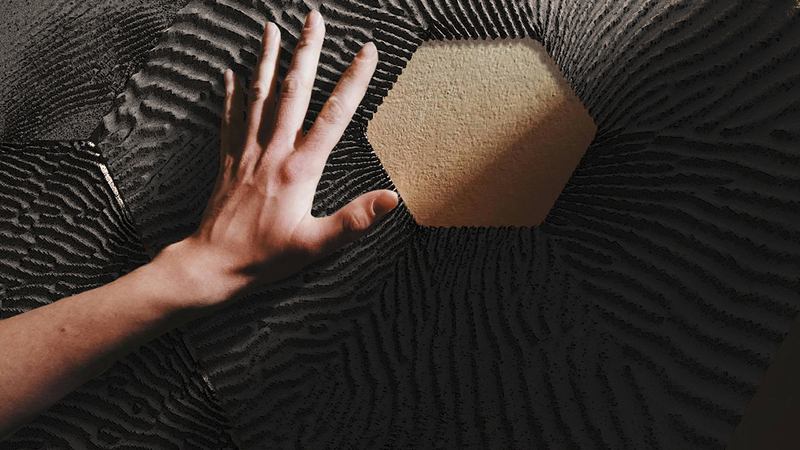 The panels were created digitally in Grasshopper by forming a hexagon applying the pattern and controlled through different types of curves. A variation of the panels was tested by making a hole in its center to have the possibility of creating lattices which affected the behavior of the pattern, the smaller the gap, the higher the definition. 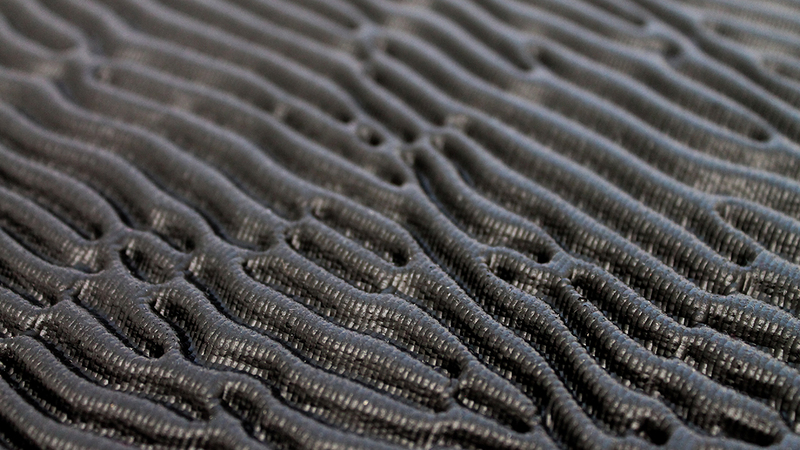 The design was thought-out by natural form patterns and elaborated from digital algorithms. The panels work as a flexible and modular coating of approximately 50x50cms, allowing the user to place them on any surface. The various reliefs in their patterns and their versatility in their accommodation bring a unique aesthetic to any interior space. They are easy to install and have a low ecological impact. The materials we used for the mold manufacturing of the panel was a 12mm thick acrylic plate from two parameters codified in RhinoCam: Horizontal Roughing Software, which roughs the mayor portion with an acrylic ¼ Flatmill bit. Afterward, the parameter Parallel Finishing; which creates the pattern figure with a 1/8’’ Ballmill bit in 90 minutes and had a 40% definition, which means 40% bit diameter of stepover. The life-span of bioplastic depends on the way it’s discarded, and its use would vary as if it is applied to an indoor or outdoor application. By investigating different materials that would extend its life cycle on an outdoor surface, the research showed that the most convenient material is the combination of cement with bioplastic. The process of mold casting, concrete+bioplastic: We use laser-cut to make the prototyping mold, then, we make a final drawing of the geometry in 2D to proceed to cut in Waterjet. 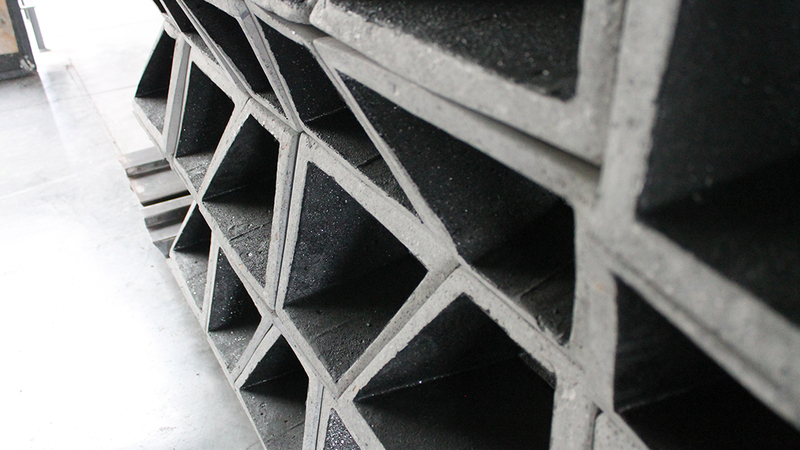 We cast concrete on the metal molding and when its dry we pour bioplastic inside the geometry as a coating. We test the flow impact on the inner bioplastic surface with the scanning electron microscope (SEM) at the lab. The modules were created using Fluid Flow Software to maximize airflow and pressure and achieve the highest level of adsorption possible and making full use of the material’s properties. The impact of our material was measured with the scanning electron microscope (SEM) images of the bio-plastic which resulted in layers upon layers of pores measuring in average 90μm. These pores are large enough to allow PM10 and PM2.5 particles to flow freely and adhere to the innermost layers. This showed a reduction of 30 percent of airborne pollutants. Verónica Saldaña Garza, Priscila Luna Ramos, Ada Gloria González, Ana Graciela González, Ana María Vargas, Andrea Lizette Najera, Barbara Garza Saldaña, Carla Ruiz Velasco, Cristina Briones Nuñez, Dana Mayeli Rangel, Estefanía Flores Jiménez, Kathia Quintanilla García, María de Lourdes Hernández, María Luisa Becerril, Mayra Valeria Moreira, Melissa Chapa Gil, Oscar Javier Alvarado, Roberto Luis Valenzuela, Sara Eugenia González, Juana Valeria González. Wonderful example of cross-disciplinary collaboration between materials scientists and designers backed by meticulous presentation of the methodology and process by which this new environmentally friendly bio-plastic was researched and created. Too often new bio-based materials are presented as the solution to all ills of mankind with little supporting evidence and in such small quantities that multiple prototyped scenarios are not possible. 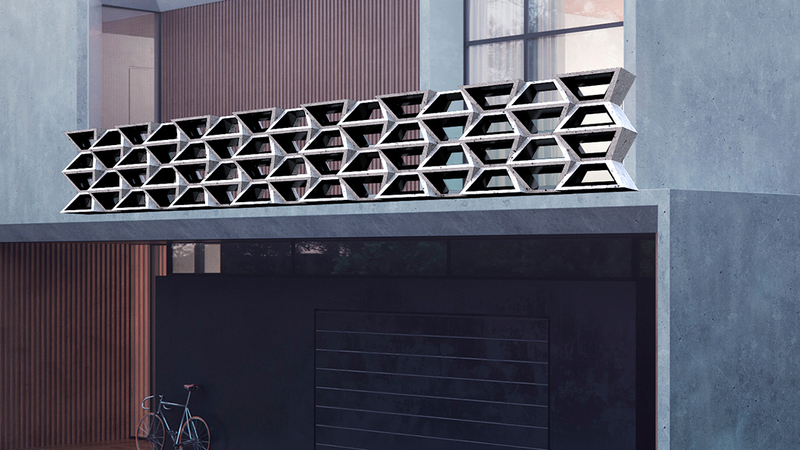 The team has made a convincing case for the cladding of structures – it would be good to see the materials in different thinner iterations that would allow a range of product solutions.